May I ask all of you some questions, please? 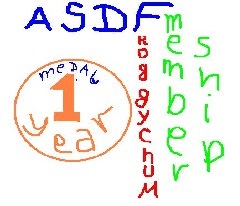 -Do you agree with me that ASDF is a forum of The Good? -What association does the word "Ivokyuftaf" make you think about? -Is it fine that I asked in one and the same topic and post questions that do not have any relation to each other? I would like to ask very politely everyone who posts in this topic to answer these questions in their first reply to it. Thanks to everyone who answers! is the good an affiliation or did you mean moral? if human, at what stage or state of development are we talking about? not only that, but in what situation and what time in that situation is this human asked of their concept? Is anything being held leverage against them? are they being defensive? oh my god the answers to your second question are hilarious lmao, those guys sound like a blast. As for me, you've told me much more than enough times that it means You Steak. and the 6s are because your autistic and like school or whatever probs both. Thank you for the answers, Froggychum! Here is the thanks, and I would thank you even without a reminder. -To the first question - I decided to let other people choose how to define the term "a forum of the good". *"Kyufte" is a word in Bulgarian and it means "Meatball" (rather than "Steak"), and I have clarified this before. *6666 - I respect the number 6 a lot. Even though, I am curious about the interpretations that the other people on ASDF would give. Again - Thank you for the answers, Froggychum! You are a good forum buddy to me. Not sure what The Good is, but I can agree is a good forum. It hopefully has a positive impact on its members. You, the user on this forum. Don't really have anything else to associate it with. Perfectly natural in this forum to go off on tangents, change subjects, or be off-topic. I assume that the word "hexaphile" means "person who likes the number 6 very much". This is a forum. On the D&D alignment scale, I'd put it somewhere in "chaotic neutral". I associate your forum name with you, as you appear on this forum. Questions that don't relate to each other are a blast! Speaking of D&D, how does one become a dungeon master? I adore D&D but none of my friends do, so my ability to practice/experience is very limited. Thoughts, suggestions? Word. I always wanted to play D&D but the lack of friends sure puts a stop to that. Which is kind of disappointing to be honest. have you tried finding some dungeons with maybe some dragons in them? Tons of resources out there if you are interested. I would suggest Matt Colville who has a ton of great advice. Start here. If you want to bring your friends in who never played before Critical Role just launched a small show about this called Handbooker Helper, there's only one video out now though. I greatly enjoy using DnD Beyond when I play, but be warned that you will have to buy the books in only digital form there, for the same price as a hardcover. Haven't tried it much as a DM, but as a player it works great. This is all extra though. Mostly what you actually need to play D&D is limited to the Player Handbook (or at least the core rules) and some imagination*. The DMs Guide and the Monster Manual are not mandatory for the DM, but are great resources to help you out. You could always try online.